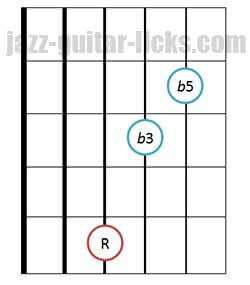 Diminished triad chords | Guitar diagrams, root positions and inversions. 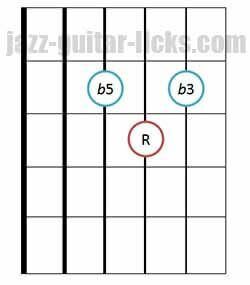 In this lesson, we will see how to play diminished triad chords on the guitar. 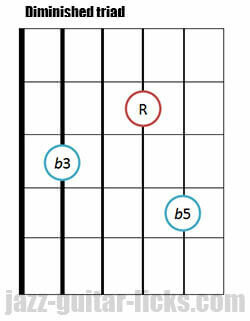 A diminished triad is made up of a root (1), a minor third (b3) and a diminished fifth (b5). 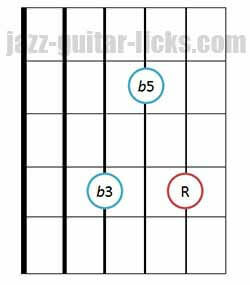 That is to say that it is a minor triad with a lowered fifth. 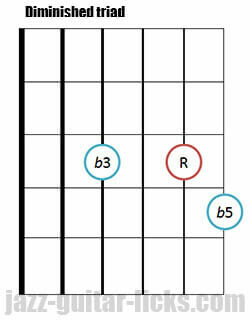 Here is a comparison with the Locrian mode. 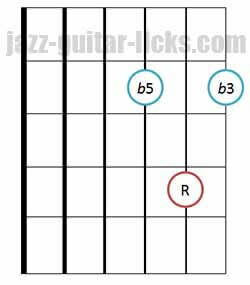 By taking the first, minor third and the diminished fifth of this mode, we get a diminished triad. 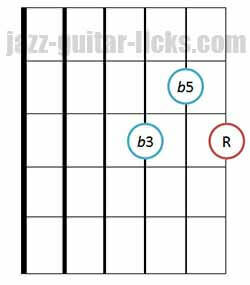 Before starting to learn and play the 12 diminished triad chords below, you need to know what is an inverted chord. 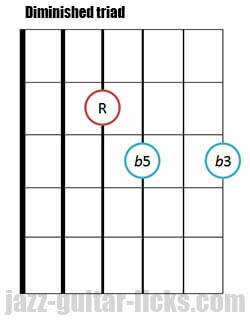 This is simply a chord whose notes has been arranged in a different order. 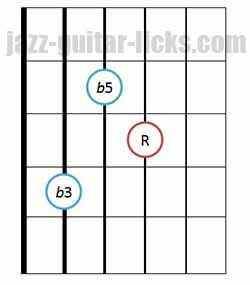 In other words, you will play the same notes as the root chord, but with the third or the fifth in the bass instead of the root. 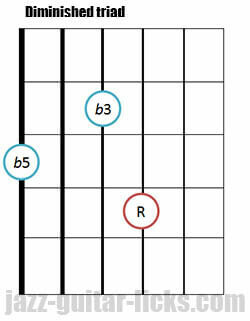 Triad chords with basses on the 6th string. Basses on the 5th string. Basses on the 4th string. Basses on the 3rd string. 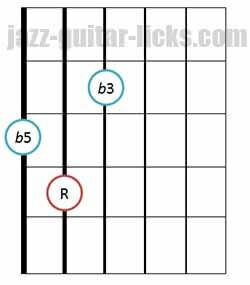 Each category contains 1 root position and 2 inverted chords. 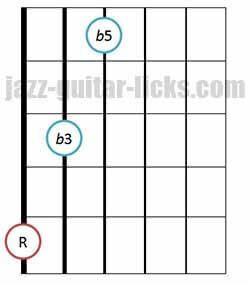 The chart below shows you the diminished triad voicings related to the chords of each category. 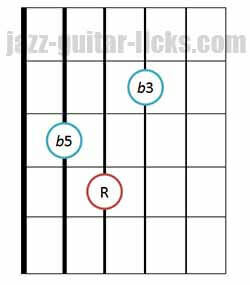 Now you know how to play closed diminished triads on the guitar (root positions and inversions), the time has now come to talk about open triads. 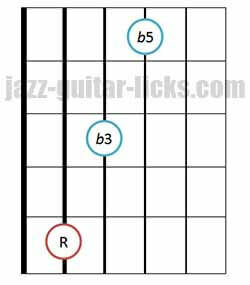 The notes of an open triad are spread over more than an octave, unlike a closed triad that has its notes included in one octave. 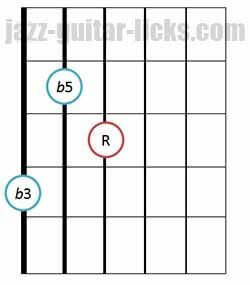 How to build open voiced triads ? You just have to drop the middle voice (so the second voice) up on octave. That's the reason why open triads are also commonly named "drop 2 triads". 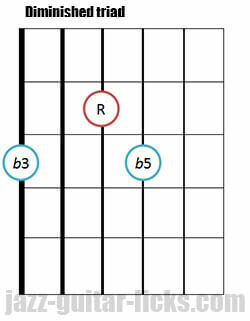 For a better understanding, let's take an example with a B diminished triad. 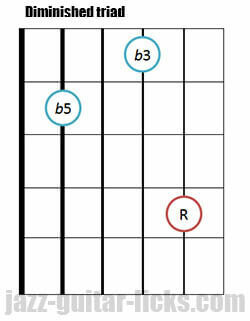 This type of triad is made up of a root (1), a minor third (b3) and a diminished fifth (b5). 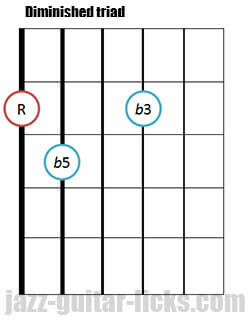 So, we get three notes : B, D and F respectively the root, the minor third and the diminished fifth when stacked together represent a B diminished closed voicing. 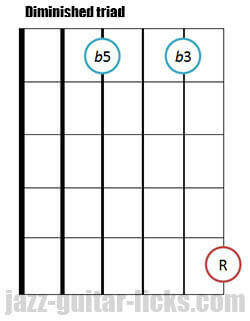 Drop the minor third (which is the middle voice of the close voicing) up an octave. 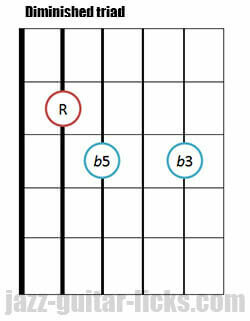 We now get a new voicing : B, F and D.
You can even mix these tones to get two other diminished voicings. 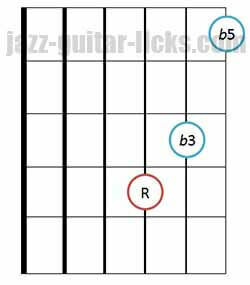 (check out the chart and the guitar diagrams below).